Oh boy, it’s more dynamite Newstalk radio for our ears! What common sense will spill from the mouths of the Ford brothers today, and how will we be enlightened? Find out below! 1:10: The Fords touch on stories that have dominated the news recently, reiterating their support for a “Scarborough Relief Line” before a Downtown Relief Line and saying that they will keep their promise on the Land Transfer Tax. Of course, Rob promised to eliminate it rather than reduce it by 10 per cent, which is what he’s currently proposing. But details scmetails, right? 1:16: “Taking Care of Business” plays Rob and Doug in, and the Fords love it. 1:17: Deputy Mayor Doug Holyday (Ward 3, Etobicoke Centre) joins the show to discuss councillor expense accounts. Rob credits the longtime Etobicoke politician with getting him focused on the issue when he joined council 13 years ago. So there you have it, the next time council talks about penny-ante office expenses rather than substantial issues, you can blame Doug Holyday. 1:26: Rob wishes the Jewish community a happy Passover. This comes on the heels of a bizarre appearance at a Jewish religious event last week. Don’t worry, though. Doug assures us Rob loves the Jews, as they’re businesspeople. 1:26: Referring to council’s office expense accounts, Rob uses the term “slush fund” two more times, which raises the number to four so far in the show. The term conjures the idea of a secret and possibly illegal fund used for personal gain, and it’s inappropriate here. There are always some questionable expenses, but the mayor should be careful with his words—although that’s arguably an unreasonable expectation at this point. 1:27: Rob talks about his use of his own office expense account. “I’m not tooting my own horn, but I came in at $19,000,” he says, tooting his own horn. 1:28: Doug is going on about Janet Davis (Ward 31, Beaches-East York) buying helium balloons for the Crescent Town Fair in her ward. Why is the city buying helium balloons? Are we in the helium balloon business, like that adorable man from Up? Doug focuses in on the issue as though he has spotted a squirrel. He concludes we are not in that business, no sir. 1:30: Rob and Doug now criticize Karen Stintz (Ward 16, Eglinton-Lawrence) for hiring a consultant for Committee of Adjustment cases with her office budget. Notably, they don’t attack allies Denzil Minnan-Wong (Ward 34, Don Valley East) or Giorgio Mammoliti (Ward 7, York West) for expensing a lunch with dog-whisperer Cesar Millan and a decorative crystal beaver, respectively. 1:30: Councillor Frank Di Giorgio (Ward 12, York South-Weston) thanks Holyday for trying to change how Section 37 funds are allocated with an amendment at the last council meeting, which lost 16-20. 1:35: Without a hint of irony, “Sweet Home Alabama” plays the Ford brothers back into the show. 1:35: Bud Purves, chair of the Toronto Community Housing Corporation, joins the show, and the Fords roundly praise him. 1:44: Doug talks about his business philosophy, which, he says, involves surrounding himself with people like Purves, who are smarter than him on their matters of expertise. The jokes are too easy at this point. 1:50: Rob on Purves’s leadership at the TCHC: “I love your accountability statement, it tickles me pink.” He then goes on to use the word “bailiwick” in proper context, which is amazing. 1:51: Rob explains his housecalls, saying that people want to see their mayor out in the city, not stuck in the office. Two weeks ago, a rough estimate by City Hall watchers had him at the office for about five hours during the work week. 1:57: Joseph calls in. He refers to Doug as Johnny Jones. He also refers to Adam Vaughan’s “slush fund” and lauds current and former City budget chiefs Frank Di Giorgio and Mike Del Grande. Joseph continues, saying that 85 per cent of Newstalk callers supported Rob in a recent informal poll, which probably says more about Newstalk callers than the mayor. 2:08: Rob talks about how he celebrated Earth Hour on Saturday night. He kept the TV on because the Leafs were playing. 2:10: Rob says that unlike his predecessor, he has never once blamed other levels of government for municipal failures, which is likely news to Dalton McGuinty. 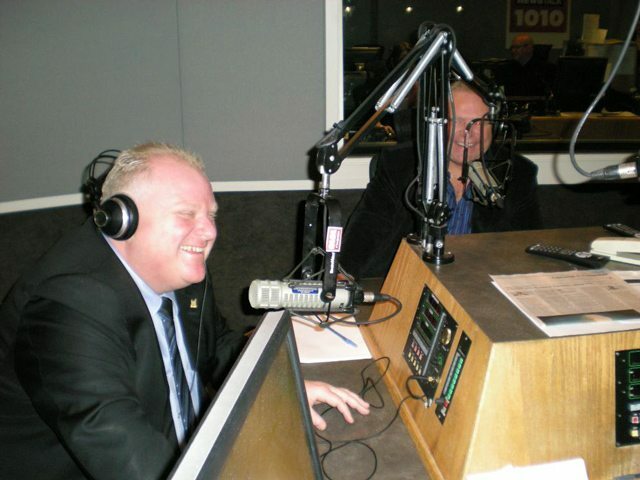 2:12: Rob provides the quintessential Rob Ford quote: “Subways, subways, subways, not those dumb LRTs!” This would be a great way for Newstalk to start its Ford radio soundboard. 2:18: With MP Lisa Raitt on the show, Doug refers to Stephen Harper’s “great leadership” and praises him as the best Prime Minister in the world. He might be surprised to learn that, by and large, Toronto doesn’t share that enthusiasm. 2:22: Frank Di Giorgio elaborates on his stunning misinterpretation of Section 37 legislation. Di Giorgio argues that the language—which is only 50 words in the provincial Planning Act—refers to the whole city rather than the local community, and goes on about how this justifies using the funds for TTC capital expansion. This is wrong. The legislation is specifically geared to address neighbourhood infrastructure needs (playgrounds, streetscapes, and so on) that come about with an influx of residents, and is very clear about this. 2:45 Doug provides the quintessential Doug Ford quote: “I don’t even like politics!” As epitaphs go, this one is pretty good. 2:47: It’s time for March Madness picks! Doug likes Louisville, which looks like it has a great path to the Final Four. Rob likes Florida State, except they’re not in the tournament. He probably means Florida Gulf Coast University, which on Sunday night became the only 15 seed to reach the Sweet Sixteen. Rob and Doug, multi-millionaire heirs, go on to explain they really like underdogs and understand them. 2:48: A caller phones in to express concern about Toronto’s homeless shelter beds, but Rob reassures her that there are lots available. But the caller interjects: she works in a shelter and consistently turns people away. Rob stands by his interpretation of the staff report, and we move on. 3:00: Doug signs off with his signature “God bless Ford Nation,” and we are released from our weekly two-hour mass. As the show goes, this was a pretty good one, full of ridiculous comments and the Fords showing their playful side. It was still sad from a policy point of view, but really, what do you expect at this point? For keeping faith and following the recap, God bless you, Raccoon Nation. 4 out of 5 Balloons.